Tomorrow marks the two year anniversary of this little blog of ours (you can see our very first ever post here), so as we did last year this time, we thought it would be fun to look back on the past year and see what all we've accomplished. Sometimes it seems like we aren't moving fast enough toward our goals, but seeing a list of all we've achieved in the last year is very encouraging and keeps us excited to continue our journey to self-sufficiency. Here's what we've been up to this past year. 1) Expanded our flock of guineas when one of our hens went broody and hatched out her own keets. 2) Got our first big snow since moving to the country and learned about being prepared for winter storms. 3) Tried our hand at making maple syrup (part 1 and part 2) from our own maple trees. 4) Contributed to our first e-book, Farm to Table through the Year. 5) Developed an easy (and beautiful!) method for drying herbs from our garden. 6) Delved into the world of beekeeping when we brought home our first nuc colony. 7) Added to our flock with five new pullets. 8) Witnessed the magic firsthand of letting a broody hen hatch out her own chicks. 9) Rescued two tiny kittens (Gizmo and Emma) who just appeared in our chicken coop one day. 10) Successfully transplanted fig trees from my grandma's garden and harvested our first figs. 11) Had great luck with planting cucumbers for the first time. 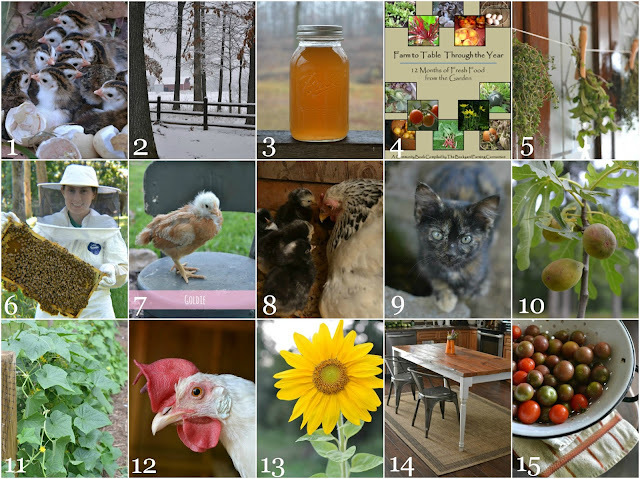 12) Opened an Etsy shop to sell prints of photos taken on our homestead. 13) Grew sunflowers for the first time. 14) Built our own reclaimed wood farmhouse table. 15) Tried a new heirloom variety of tomatoes with great success. We're really proud of all we've learned this past year and can't wait to see where the next year takes us. We hope you'll continue to follow along in our journey! i think you have much to be proud of! Happy Blogiversary! You've accomplished a lot in two years. Happy Blogiversary! You've accomplished so much! I just adore that table!!! It was fun to go back and read your first post. Happy Anniversary my dear! I hope you are enjoying blogging as much as I am reading! Can't wait to read your very first post! FUN! So wonderful and so much more to come. Happy Two Years!!! This is such a great blog! I have so enjoyed reading about all your adventures and accomplishments! You really should be proud of all the two of you have accomplished. You have a fantastic blog, amazing photos, and are inspiration to many. :) Happy 2 year Blogoversary!! Congratulations on 2 great years of blogging! I am so happy I came across your wonderful blog! I enjoy every entry! Much success on many more years! This was an amazing year for you both! I love the format you used for writing this post...I am going to check out your post for drying herbs. Isn't it fantastic that you've been able to document your adventures on a blog? Although I have my own reasons for blogging, my husband thinks it's a great chronology of our family's life. I so enjoy your blog. Happy Anniversary and wishing you many more years! What an exciting and wonderful year. I remember the maple syrup episode...lots of work... I guess I ws along for most of your journey. May you have another great year. Blessings! Phew that is a lot this year! What a fantastic idea to have an annual review, I love it! Congrats on two years of blogging. I always enjoy my visits and am looking forward to your next year to see what all you two do. Happy Anniversary Tammy and David! Tammy, happy anniversary..What a great year and review. I am looking forward to reading more on your homesteading and cute farm animals. Congrats! Have a happy day! Wow! You've accomplished so much already. That's awesome. Congratulations! Of course I'll be tagging along for the journey, if the Lord's willin' and the creek don't rise! :-) Happy 2nd anniversary!!! oh i loved the recap and happy blog-a-versary! Fantastic - I can't believe how much you have accomplished over the past year! Happy bloggiversary! Happy Anniversary on your blogging. Here's to many more. You guys have accomplished quite a bit! It's always satisfying to look back at your accomplishments for the year and get inspiration for future projects. Happy Anniversary, I look forward to reading about your future projects! Congrats on the milestone, and all that you've accomplished in the last year! I love reading about your home adventures. Congratulations on those two wonderful years Tammy! You are an inspiration. You've accomplished a lot, can't wait to read more about your journey. Congrats. Ya'll have be quite productive this year! Happy Anniversary and what a wonderful celebration. What a "fruitful" year you both have had!! I've enjoyed following you and appreciate everything I have learned from you Tammy!! God Bless you both and I look forward to your upcoming year!! I'm so happy to have found your blog! You have had a busy year and heres to many more to come. Thanks for always helping me with my chicken questions! Congrats guys. I am only about 10 months in and I appreciate all the hard work you must have put in to make it this far. You're enthusiasm is lovely! What a great list of successes.